This last month, a “group of choreographers visited San Francisco County jails to make sure inmates were able to participate in the global actions ” (Rivas). Lately I’ve been thinking ways to incorporating events happening outside of the prisons and jails and how to make them available for people behind bars to participate in… beyond sharing an video that has been taped and then approved to be viewed inside of an institution. While this program is not directly library related, it makes me continue to think about how to provide effective programming that can build community with fellow inmates and on a larger scale outside of the institution. 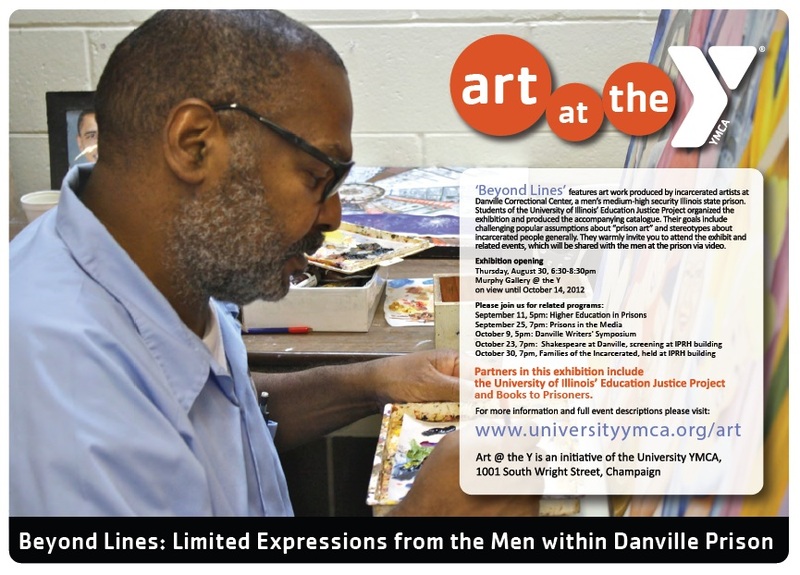 ‘Beyond Lines’ features art work produced by incarcerated artists at Danville Correctional Center, a men’s medium-high security Illinois state prison. Students at the University of Illinois’ Education Justice Project organized the exhibition and produced the accompanying catalogue. Their goals include challenging popular assumptions about ‘prison art’ and stereotypes about incarcerated people generally. They warmly invite you to attend the exhibit and related events, which will be shared with the men at the prison via video. The event is sponsered by the Education Justice Project (EJP) and B00ks to Prisoners. 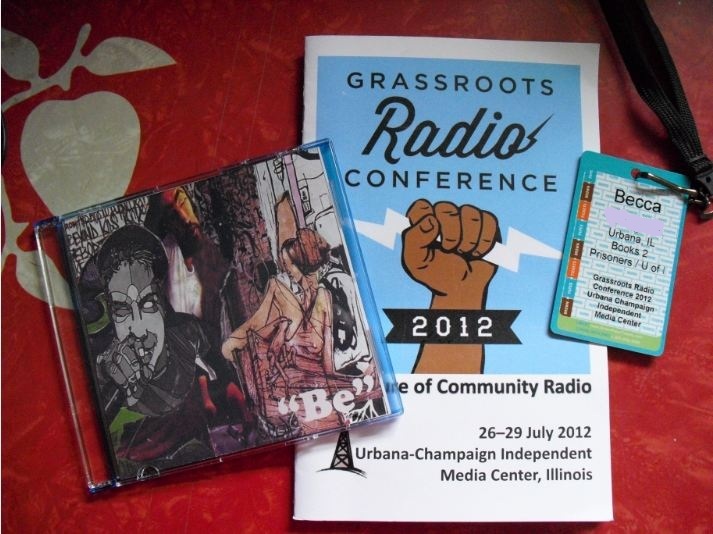 This weekend I volunteered at the Grassroots Radio Conference‘s registration table and attended the panel Bustin’ In, Bustin’ Out: The Key to Prison Justice. Below are the panelists with links to their affiliated organizations. Bustin’ In, Bustin’ Out: The Key to Prison Justice seemed like a great interest point to my studies and as a follow up to the documentary that I previously wrote about, Music From the Big House. This documentary showed one of the men behind bars as a DJ at Angola prison’s radio station. Apparently this is a rare occurrence in the PIC and prisoner-ran radio stations are more popular in Europe. Since I’m am not all too knowledgeable about radio, I’m going to provide as many resources and projects I’ve learned about during this session. The common theme in this session was on communication to the outside world whether through books, radio, or the telephone. Prison Phone Justice is composed of three organizations: MAG-Net, Working Narratives, and Prison Legal News. Put into simple terms, up to 60% of the costs of calls from prison has nothing to do with the cost of the phone service provided. So when Mary talks to her husband 40% percent of the cost is for the service and 60% is a kickback to the state government. The vast majority of states receive kickbacks from phone companies, which result in higher phone rates. These excessive rates further distance prisoners from their families, who can ill afford high phone bills. While most prisoners are from urban areas, virtually all prisons built in the last 30 years have been built in rural areas far from where most prisoners have family or community ties. The nation is disadvantaged when prisoners are unable to maintain family ties that will help them succeed post-release. There is a widely-known and researched correlation between prisoners who maintain contact with their families and those who are successful in staying out of prison after they are released. Most states profit handsomely from prison phone kickbacks, to the tune of over $152 million a year nationwide. Continue reading the brief of there campaign here. 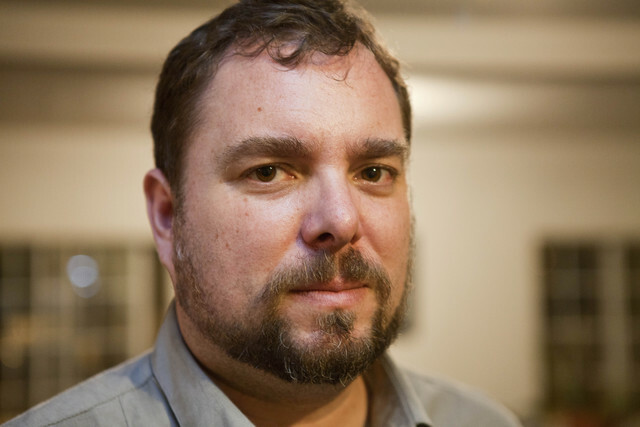 Nick Szuberla, Thousand Kites, stated that the radio not only can bring voices in, but can also bring voices out. Their radio program created accountability to the rural Kentucky prison that severely isolates people behind bars from urban areas, for example the nearest bus station and airport is three hours away. You can read more about this program through this article, Don’t Hate the Player: Radio Project Reaches Out to Inmates and Their Families, Breaking the Silence Around America’s Prisons. Join our special radio program that brings the voices of families across the nation to the airwaves as they send greetings directly to their incarcerated loved ones. Yesterday was the screening of Music From the Big House. You might remember that I already wrote a post about it: You Can Hear It Through The Prison Walls: Music with Rita Chiarelli and of Johnny Cash. The making of this documentary, Music From the Big House, began when Rita began her journey down the Blues Highway – U.S. Route 61. Her first visit into the Louisiana prison, Angola, began by a cold call from a near by gas station to ask if she could come in a visit, to see the prison where there is a rich history of blues music – including Lead Belly’s Goodnight Irene. While doing research, with the intent that I would make every stop that is a must on this pilgrimage, I came across Louisiana State Penitentiary, aka Angola. The information about this place jumped out at me. This was a place that had a musical history, a history that had been archived in recordings – inmates recorded as they worked, spirituals, work songs, and blues… and songs by their famous ‘son’ Lead Belly. It was my quest to add to the prison’s musical history, or maybe I should say ‘to provide an update’. During her visit, a discussion with the warden began… after hearing that many musicians have performed concerts in the prison, Rita had a unique idea – to perform a concert with the men of Angola. That was something that had never been done before and the documentary was part of documenting this new experience and the present state of music at Angola. Music is performed in the genres of jazz (The Jazzmen), country (Little Country), and gospel (Pure Heart Messenger). From each of the bands, the audience has the opportunity to get to know the some of the men via conversations with Rita. One of the men we get to meet is Ray Jones from the band Pure Heart Messenger. Ray is also Angola’s law librarian and in the film we get to see him in the law library where he also religiously counsels fellow men behind bars. Through the documentary, we see Rita struggle with being in Angola… one scene is of her in her hotel room and after a verse on her guitar she becomes heavy and embraces her guitar. Later on we see her express getting to know the men who are truly sorry for the crimes that they have been committed (and that perhaps their sentence and confinement is unjust) and then she expresses that we also cannot forget the victims. During Q and A, an audience member asked if the men in the film had a chance to see it. They did. Rita stated that she was nervous during the scene when she talked about the victims, unsure how the men would take it. They expressed that thinking about the victims was part of their journey too. At the end of the screening in Angola, Rita received a standing ovation. In the Q and A, an very young boy asked her how the first time in the prison made her feel; her answer was that she couldn’t get it out of her head – the size of Angola is the size of one of the New England sates… which one I don’t remember now that I’m home. To say the experience changed me is an understatement. I’ve been changed forever. I was nervous to talk to her… not everyday do you meet someone with the title of Queen of Blues! Oh, goodness! I could barely ask my question without crying because I’ve let the emotions of trying to find the right balance dwell for so long without knowing how addressing them. Rita gave me a big hug and let me have my moment. She pretty much told me I would figure it out. I don’t really remember what else she told me, but before I left, she held my hand tight and it felt like she wouldn’t let it go. Having someone who understood what it is like to have to deal with one’s emotions of being in the PIC expressing that I’ll find my way and provide physical comfort through a hug and holding my hand was incredibly comforting (especially when being far from home and away from a community where long hugs were abundant)! 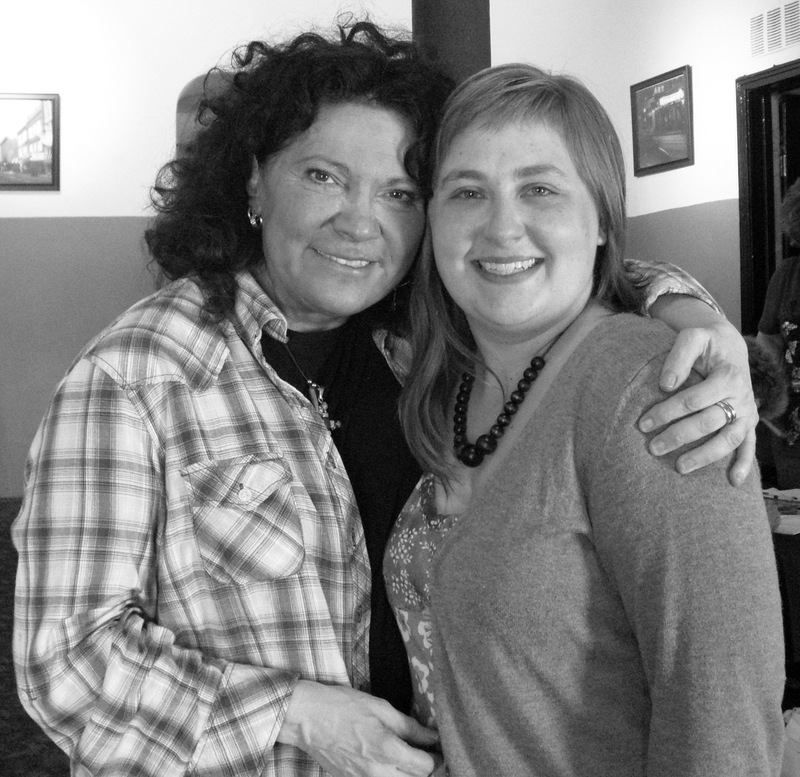 So, Rita Chiarelli, thank you for the hug and sharing your musical journey with us. What you have shared is shaping my journey with prison librarianship. For more information on Rita Chiarelli’s documentary visit the documentary’s website. Rita’s tour is half way done – check out the rest of the tour dates on the website! Part of the sound track’s proceeds are going to Angola’s music department. I came across Delicia Greene, PhD student, this week – put this woman on your list of important people and to keep an eye out for! Greene is a doctoral student at the School of Information Studies at Syracuse University, working on her proposal: Concrete Roses: A Case Study Exploring the Reading Engagements of Black Adolescent Girls in an Urban Fiction Book Club. Why is Greene working on her doctorate? “It was my work with middle school students, libraries and literacy that led me to pursue my PhD,” Greene states (Schroeder). Once I watched the first YouTube video of Greene, I watched all of them. I can’t wait to read her dissertation! Schroeder, Gretchen. Doctoral Student Delicia Green Receives Two Honors. ISchool News. 27 June 2011. 1. I wish I would have been able to go to ALA.
2. I wish I would have been able to see Sapphire at ALA! Sapphire’s Story: How ‘Push’ Became ‘Precious’. NPR: All Things Considered. 6 Nov 2009.